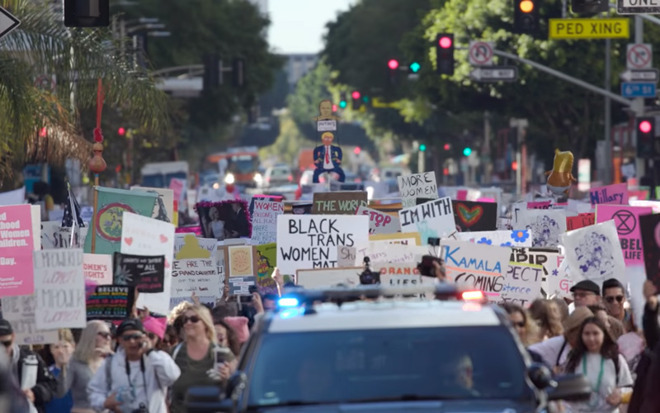 Continuing a marketing campaign ahead of tomorrow's International Women's Day, Apple on Thursday premiered "Global Feminism," a star-studded video paired with a matching Apple Music playlist. The short clip is narrated by singer Annie Lennox, who talks about the inequalities and rights violations women still face around the world. These include problems such as pay gaps, maternal mortality, and sanctioned domestic violence in countries like Russia. To drum up extra publicity, statistics quoted in the video are echoed on signs held up by a number of celebrities. These include people like Mary J. Blige, Ed Sheeran, Eve Ensler, Gwendoline Christie, Hozier, and Eddie Izzard. The Apple Music playlist features artists like Aretha Franklin, Nina Simone, Dolly Parton, Regina Spektor, Bikini Kill, and Lennox's former band the Eurythmics. Apple kicked off its Women's Day campaign a week ago, when it announced a partnership to bring its Swift curriculum to everyone in Girls Who Code. Apple stores are holding special "Made by Women" events, and feminist themes are appearing in places like the App Store, Beats 1, and even an Apple Watch Activity award.